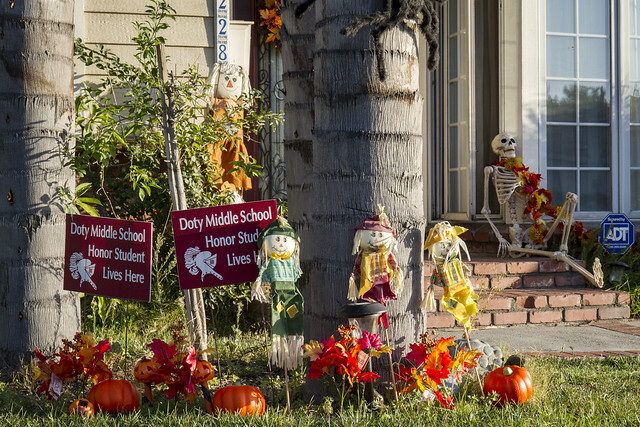 I missed Halloween in Downey this year. 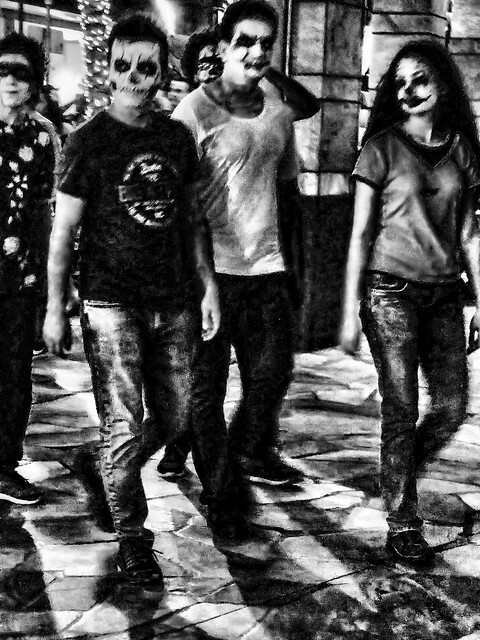 But, I certainly had my fill of seeing people in a variety of creative costumes. 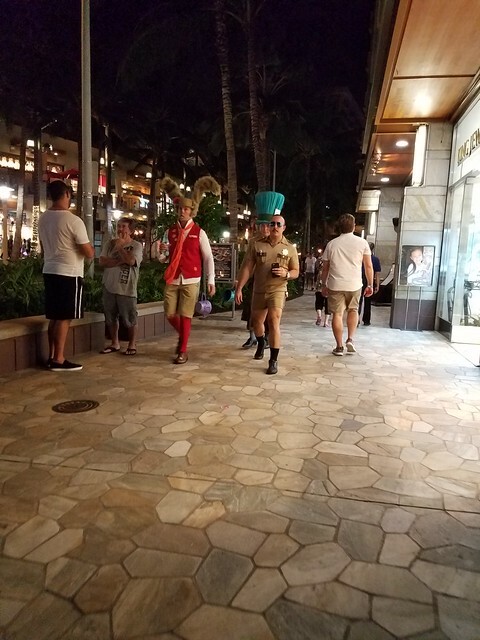 People were wandering around Waikiki enjoying the evening and showing off their often scary Halloween disguises. 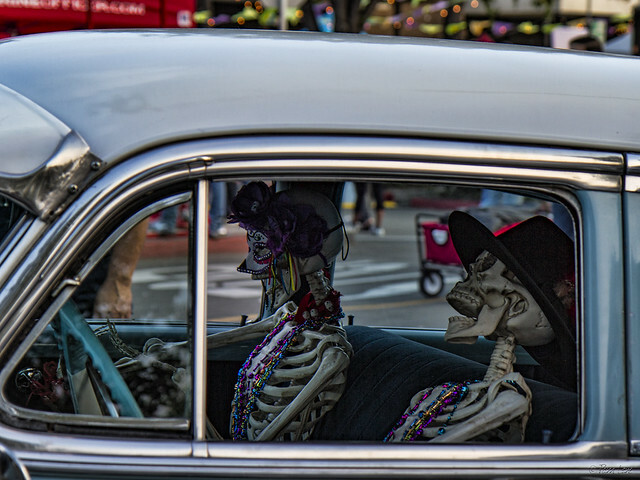 "Hey, hon, how about a drive to the 5th Annual Day of the Dead Festival?" "Sure, sugar, let's put our skulls together and have some fun!" There were lots of skulls around yesterday, in all shapes and sizes (and materials). "The word "Death" is not pronounced in New York, in Paris, in London, because it burns the lips. 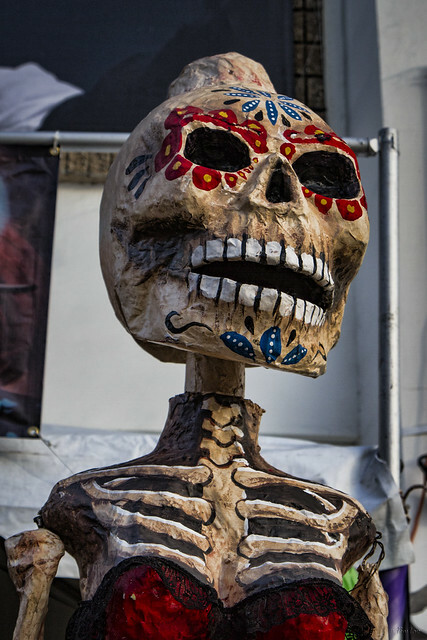 The Mexican in contrast, is familiar with death, jokes about it, caresses it; it is one of his favorite toys and most steadfast love." 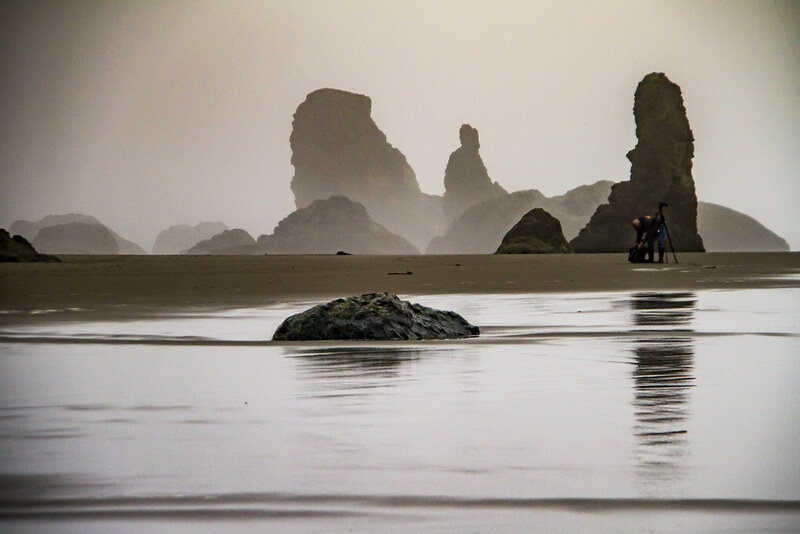 Exploring some of Oregon's coast this past week has been an adventure. I have enjoyed the power and the drama of the settings, often with the ocean raging from a recent storm. 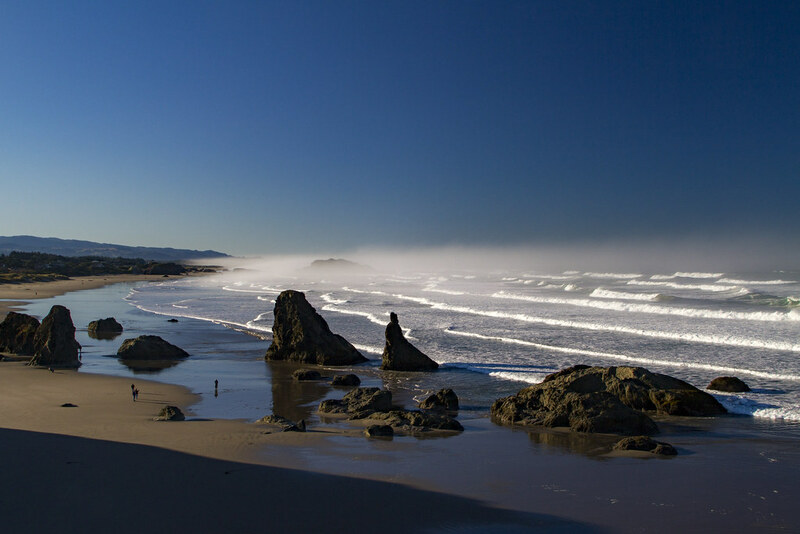 Add to that some incredible, massive rocks and mist and you have quite a spectacular coastline. "I believe that I am the same as everybody because I have feelings, I love others and I can get upset. I love all kinds of music, Cuban music, rhythm music, classical music. I get angry when people talk about other people or when they judge what other people are like based on how they look, when they don’t like someone just based on how they look. I love to walk down the street and smile at people to make them feel good because that’s how I feel when they smile at me. "I am unique because when I was 9 years old, Castro took power in my country of Cuba and life became very hard for me and my family. After 8 years, my father decided to leave Cuba and immigrate to America. When he submitted his forms, my mom, my sister, and myself were sent to work on a government farm that was like a concentration camp while my father was sent to a different farm. Our family had a number around 33,000 and we had to wait until they reached our number. We worked on this farm and were separated for 4 years until our number finally came up and we were allowed to come to America as a family. This is why I get so upset with people who come to America illegally. I’m so glad my father decided to make the sacrifice and request to immigrate. It has been worth the hard work and pain we went through to live here. This is now my country. This is the country I would die for." "I consider myself as everybody else. I'm 77 years old but I feel like I'm 20. The mind is willing but the body isn't cooperating. I like music, technology, art, and people who are honest. And like most people, I get angry at injustice, when things aren't like they should be. 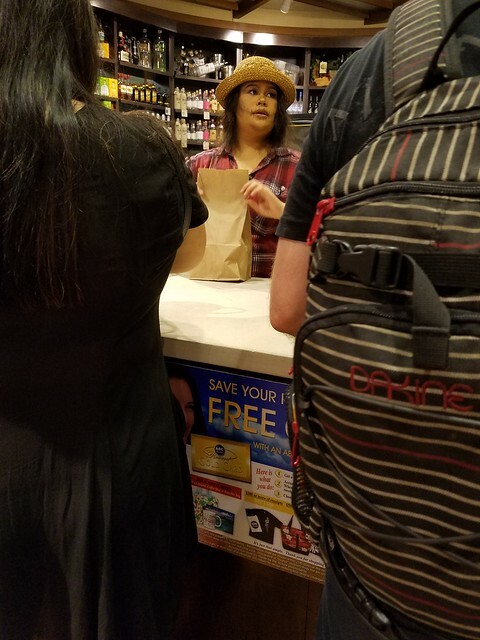 "I am unique because I emigrated from southern Argentina. The thing that made me emigrate from Argentina was the corruption and injustice. I am not here for economic reasons but for moral reasons. I was looking for a place where the main factor in the environment was honesty. And I found it here." 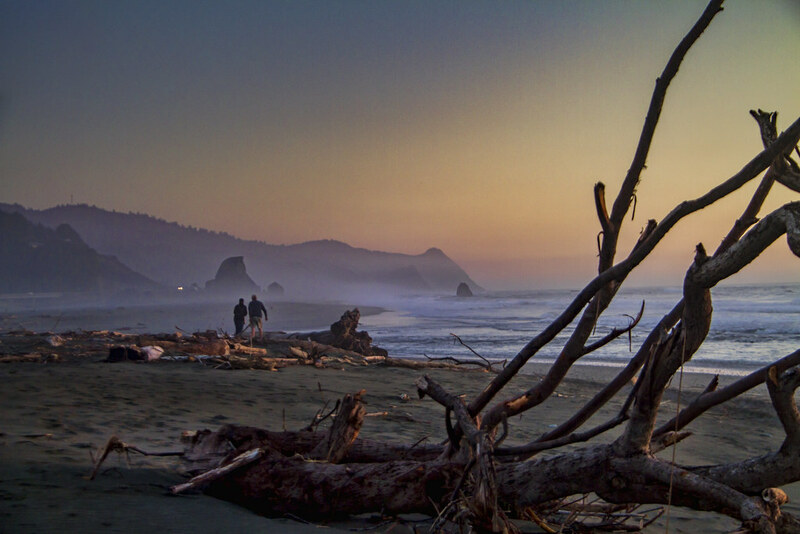 Sunset on the beach is one of the most beautiful scenes I can imagine. Tonight was incredible. We had this gorgeous ball of sun that slowly settled past the horizon. 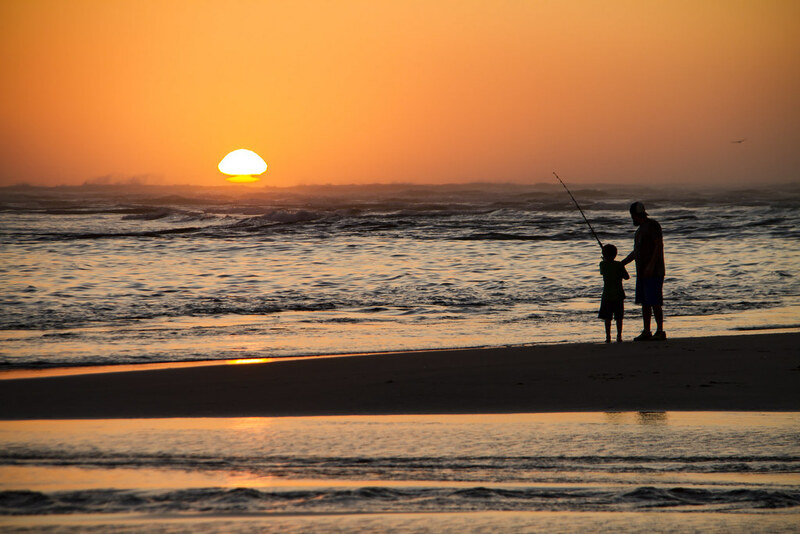 Families were out playing on the beach and enjoying the colorful end of the day. 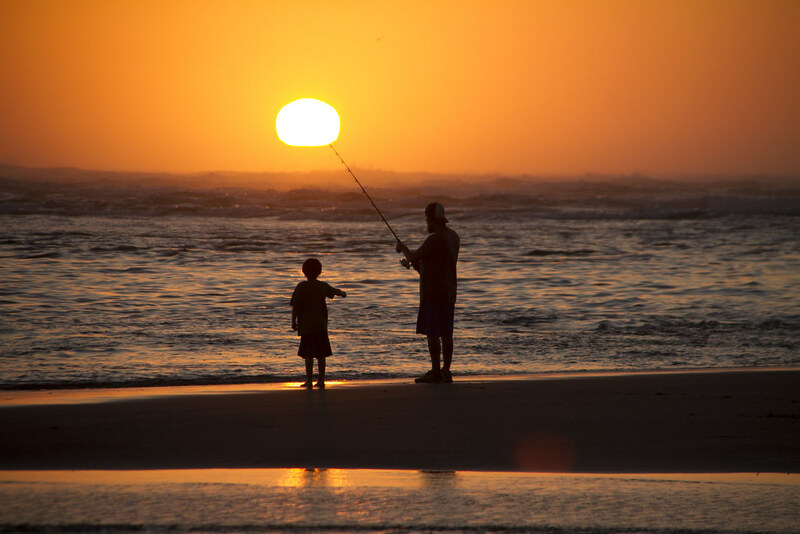 It was sweet to watch this dad show his son how to catch a fish. "It is almost impossible to watch a sunset and not dream." In Downey, we enjoy our proximity to the beaches. 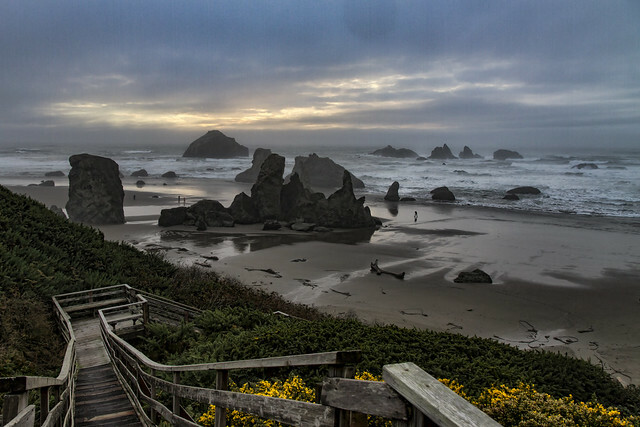 But a vacation provides the opportunity to stay within walking distance of a beautiful Oregon beach. Even a rainy day can be beautiful when you can watch the sun set over the ocean. 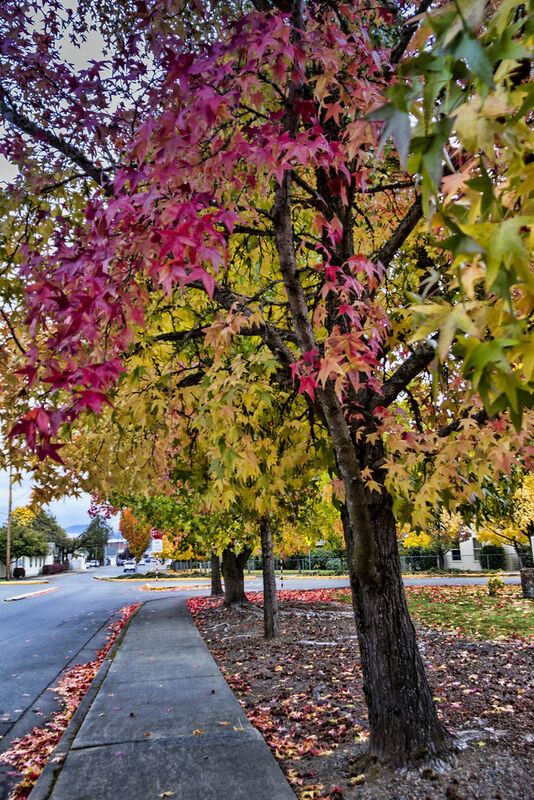 While Downey is headed into a heat wave for this weekend, I am out of town and currently in Grants Pass, Oregon, where tomorrow we will have a high of 64 degrees. I haven't been here in several years and I forgot how beautiful it is in the fall. What a treat it was to encounter. The trees are brilliant and absolutely beautiful. 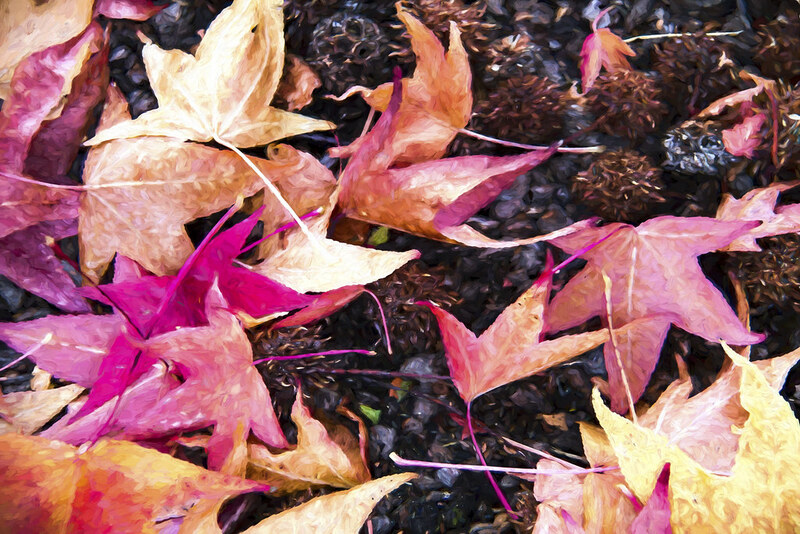 "Every leaf speaks bliss to me, fluttering from the autumn tree." This walkway caught my eye the other day. Actually, it was the bright orange flowers that really drew my attention. 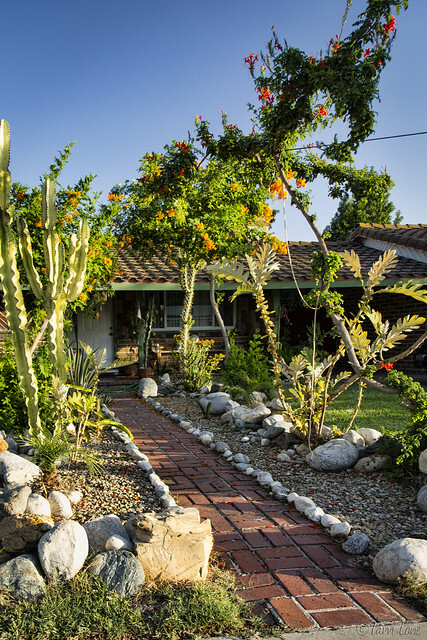 Then I noticed that the entire pathway is landscaped with drought-resistant plants—perfect for southern California weather. 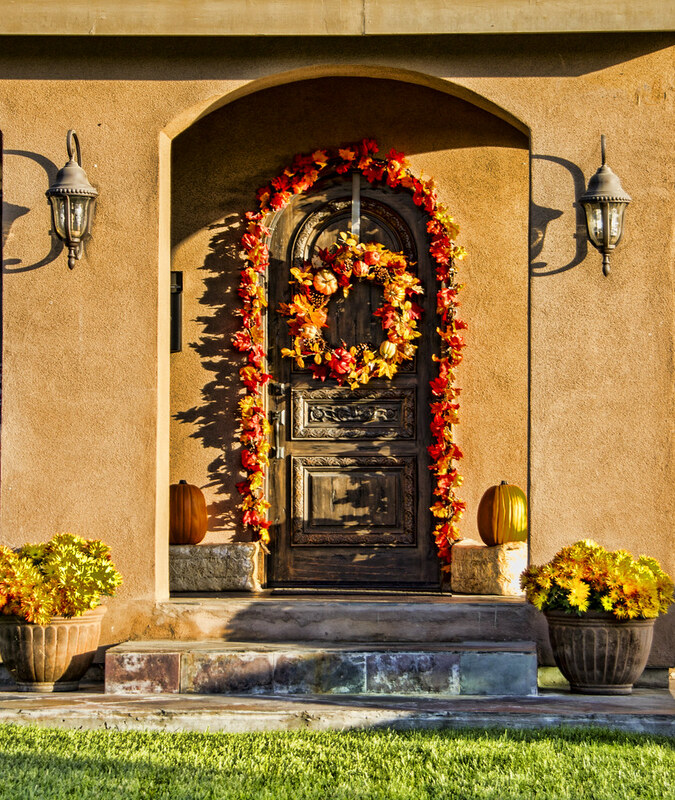 It makes for an appealing, if prickly, approach to the front door. October is the first full month of fall and one of the ubiquitous activities of fall is a marching band performing at halftime at a football game. I used to play in band in high school and I know you need to put in lots of hours practice to pull off a great performance. These Downey High band members are putting in those extra hours to be the best they can be and entertain the fans this Saturday. You should buy a ticket and see them perform. They still have flag twirlers too. 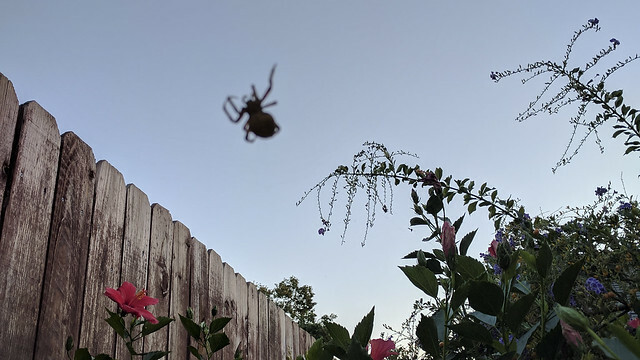 Keeping with the October holiday theme, I spotted this guy building his web in my backyard the other night. It was very scary to try and get close enough for a decent picture that would show you just how big this spider is. His abdomen was as fat as the end of my thumb. Spooky! 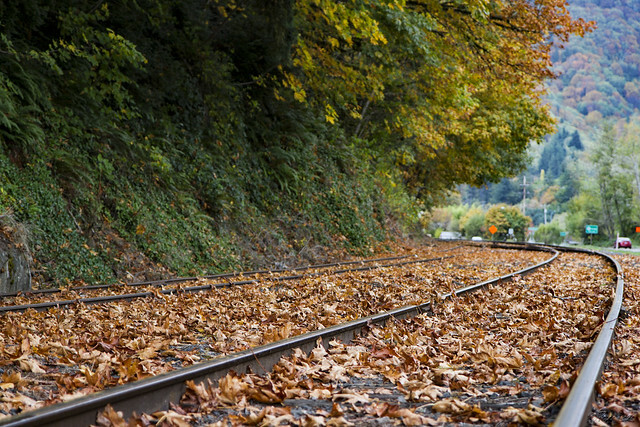 I like autumn and find myself anticipating the colors of fall. This house looks so inviting in the late afternoon sun. 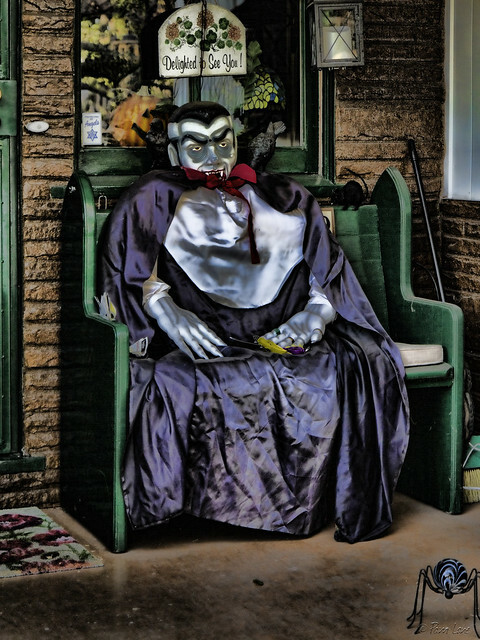 In addition to the spiders crawling all over (Spooky spiders), this house is a temporary home to Count Dracula and a couple of ghosts. "I have crossed oceans of time to find you." 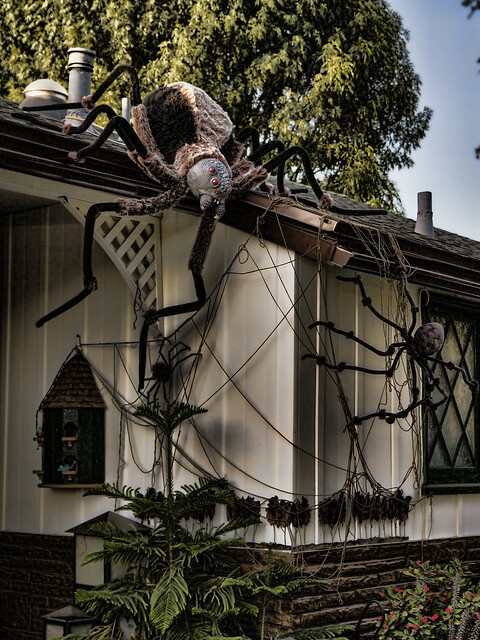 It is always interesting to find how people decorate their yards and houses in preparation for Halloween. 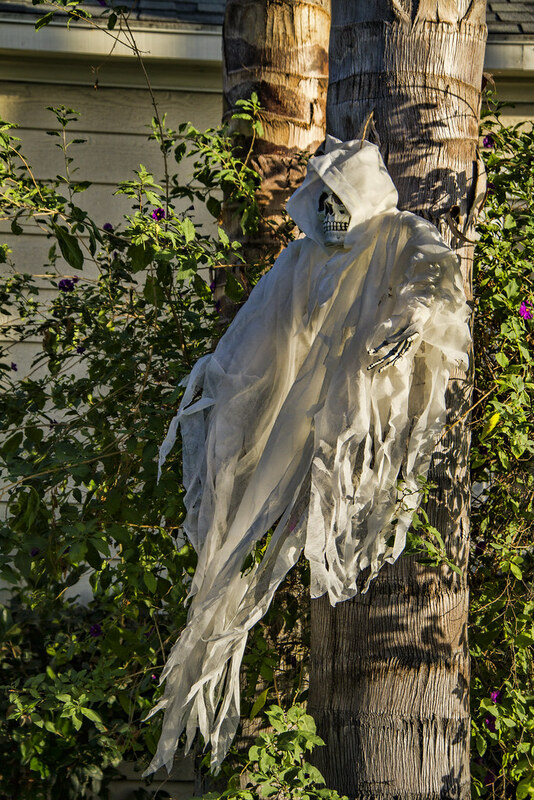 This skeletal ghost was pretty spooky even in daylight with the wind breathing life into his ghostly form. The sad intangible who grieve and yearn . 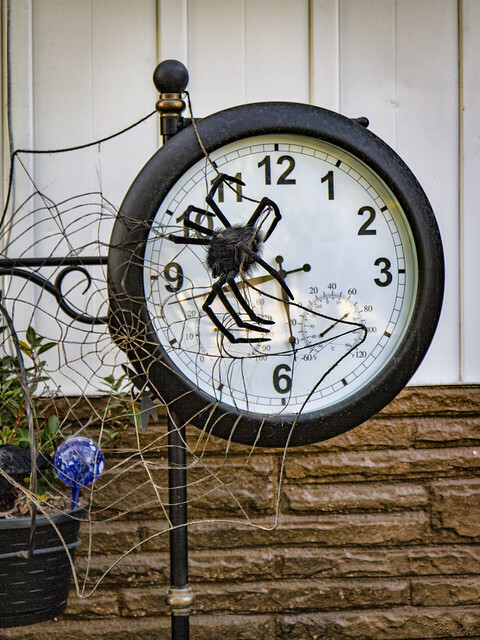 . . "
We've posted about the fun yard art at this house before (Sunsets and yard art and His bark is worse than his bite...), but we've never seen it this time of year. It turns out that this family really does it up for Halloween. It's spooky enough during the day. I can't wait to see it on Halloween night. "Remember when you threw a shoe at me and I fell somewhere behind the bed? "When it comes to our spirit and soul, as humans we're designed in a very specific way so that our personalities are the unique parts of ourselves. With emotion, whether it's pain or joy, those all come out through our personality, but that is what makes us the same. We all have that spirit, that soul. There are very specific things that drive people and they are all very different. But that drive, I think I'm the same as everyone else that wants to get somewhere. Specifically, I share a desire to be significant, a desire to have my life count. "I am unique in something that I've experienced within the past year, an extreme loss in a weird way. My older sister, my dear sister, we almost lost her to a very rare disease. But she survived, she made it. But she isn't the same. It is a very interesting grief to process because there is a handbook on how to handle grief when you lose someone. 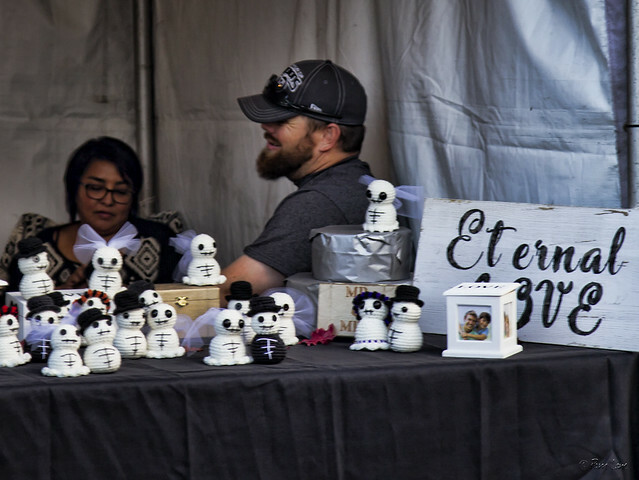 But when someone is still there but they're not quite the same, how do you grieve that loss and how do you embrace the something that's still there? "For me, the only way I've been able to process this loss is to be creative: through painting, through music, through expressing how I'm feeling in sound waves and in color. I think that's unique to me because that's how I've experienced it. My parents went through the exact same thing, but they experienced it differently. The 20-year-old people I know don't have that script. It is my own and I own it wholeheartedly. I've taken that and worked on turning it over for good, not letting it hinder me, but to use it in a way of saying, 'OK, how can I use this to love on other people through this pain that I've experienced.' I think some people might turn inward after experiencing something similar. So, that's my goal every day. How can I show people that they are loved and they do matter. That's a really hard thing to do." "I am the same as everyone else because I get up each morning and look at the world just like everyone else and I interact with others. I feel hurt when I hear things said about me that I think are unfair. I feel good when nice things happen. I feel energized and happy when I see people treating each other nicely. "Although, let me tell you two stories to show how I am unique. My parents were both musical and we had a piano in our home, which I love to tinker with. Then, I received piano lessons as a gift for my 8th birthday, and even at that age I knew I wanted to be a musician. "As a 12-year-old, I was a good singer. I played Amahl in the Christmas musical called "Amahl and the Night Visitors" by Gian Carlo Menotti. This was in Orlando, Florida, where I was growing up at the time. So, I was in front of audiences at the age of 12, singing soprano and playing an acting part. Although, I didn't take that any further. In the same year, being a promising piano student, I tied for first in a statewide piano competition. This allowed me to play several times with the Florida symphony. All as a 12-year-old." PS Downey Symphony will be performing a Lars Clutterham composition in January, 2018. I came across this the other day driving through north Downey—just on the outside wall of the 5 freeway. 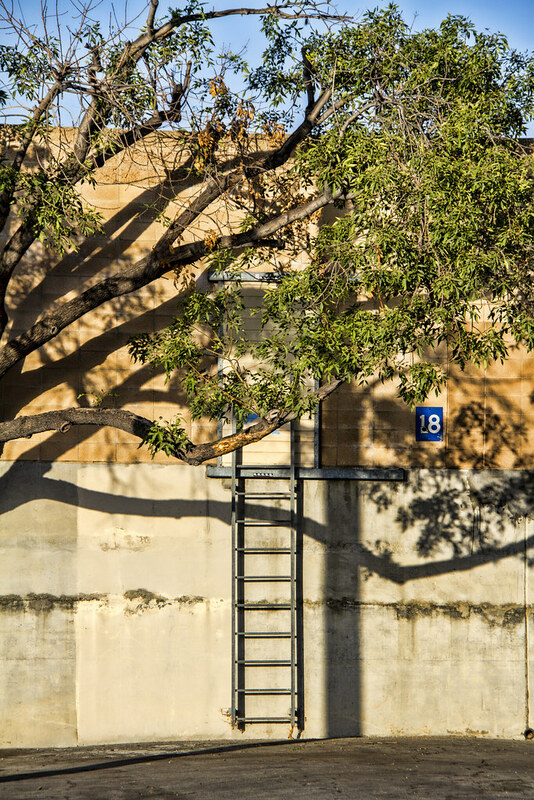 I thought it was so interesting to have this ladder and the tree shadows on the wall. It had me wondering how many times the ladder is used and why it might be important to have this access. 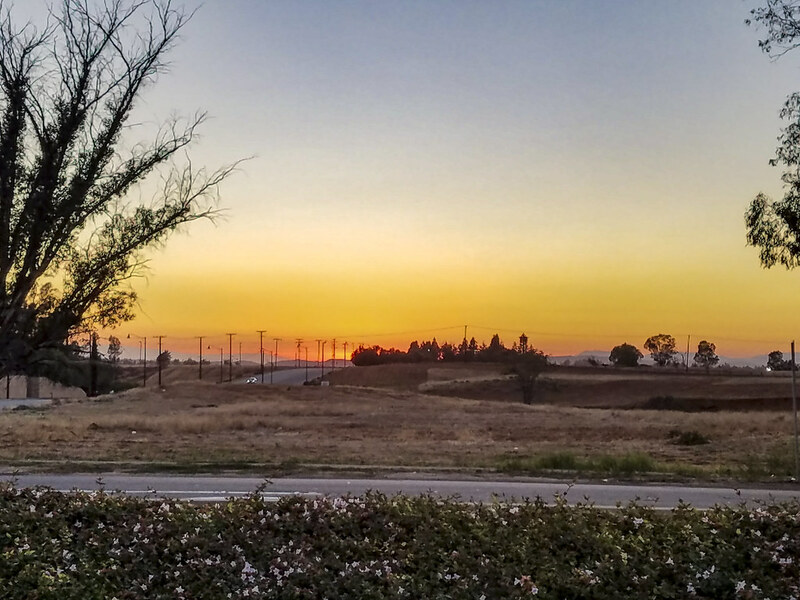 I'm cheating today, because this picture was not taken in Downey. And, I know I have shared more than my share of twilight and light pictures, but it really is the "magic hour." It's Halloween again at the Second Tyme Around Thrift Shoppe. 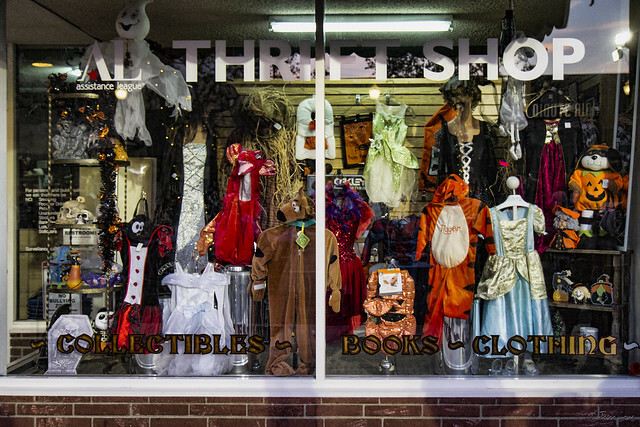 The window is filled with bargains on everything from princesses to Peanuts to pumpkins—evidence of Halloweens past. "Clothes make a statement. 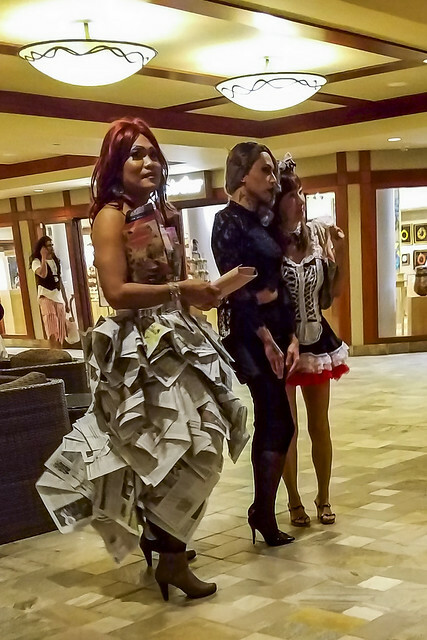 Costumes tell a story." 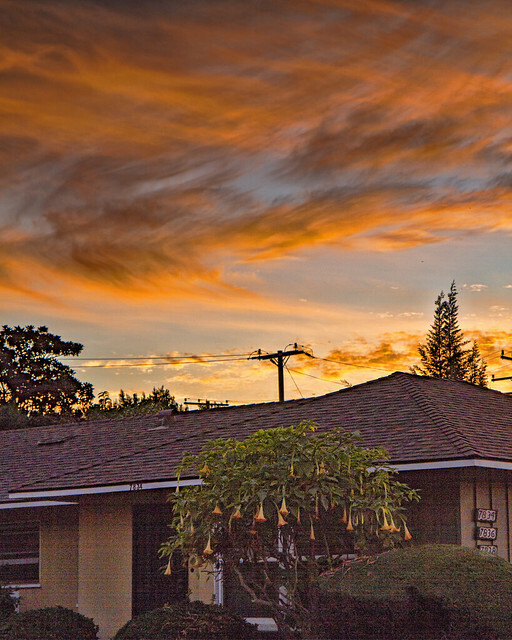 This is a panorama picture of the sky over Balboa Island that I took on a recent vacation there. It's just 30 minutes south of Downey. I'm showing it because of its beauty but also to show how far photography has come. I took several stills of the skyline and made sure that they were at the same level and overlapped each other. Then Google pictures put them together as a panorama. Years ago you would have had to do this with a special lens that would have distorted the horizon. Or you could have achieved it by using very time-consuming special techniques in the darkroom. But this is so easy and beautiful. I use it when I want to show the 180-degree view I have somewhere. Try it sometime. "A well-ordered life is like climbing a tower; the view halfway up is better than the view from the base, and it steadily becomes finer as the horizon expands." 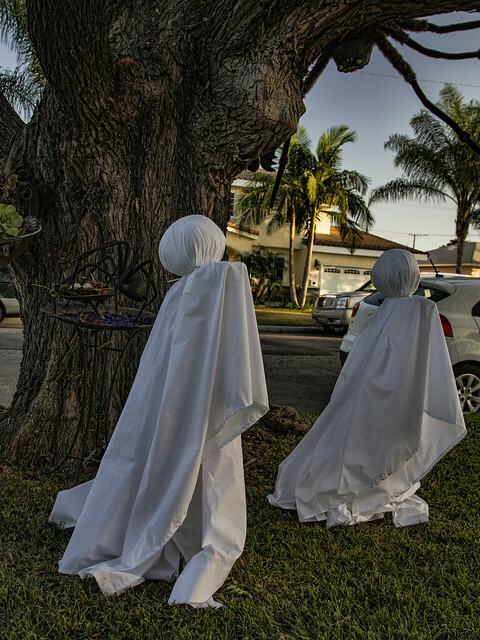 These sentinels of Halloween are popping up all over lawns in Downey. This little one just popped up a few days ago. A little worn from his travels but with a big smile to greet me. I was just driving down the road and all I could pay attention to was the fiery sky. It was powerfully bright and full of color. "The sky is the daily bread of the eyes." Dogs bark when you pass, and rush to the fence to either greet you or warn you away. 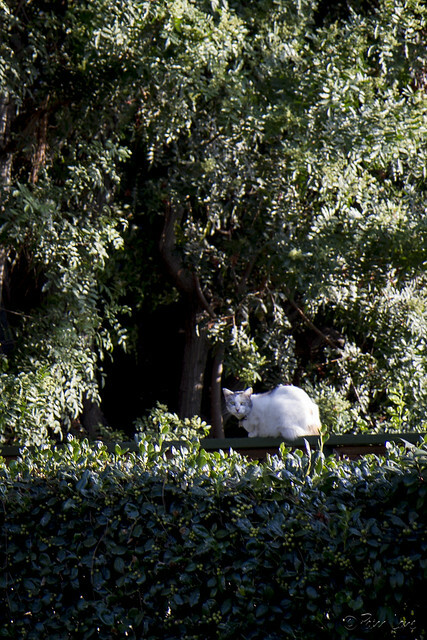 But cats just watch. 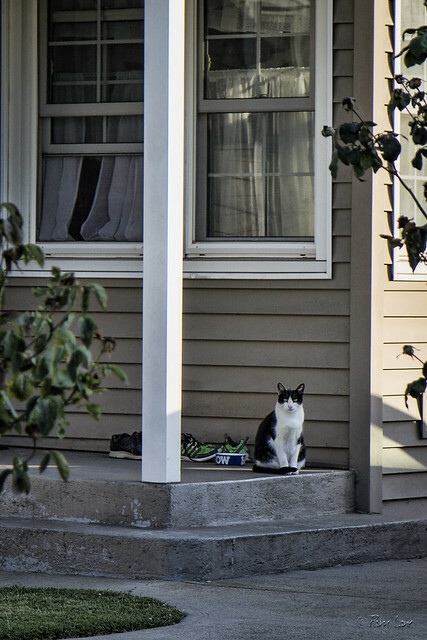 They are everywhere—sometimes hidden, sometimes not, aloof and confident in their place in our world.